Interior Design : The Cherry Blossom Pub is a limited time pop-up in Mockingbird Hill, a popular sherry and tapas restaurant and bar in the Shaw neighborhood. People in Washington, D.C. are lining up for hours together to get into this unique bar. This bar has an unexpected interior on one side which is totally transformed into a nintendo dream world, inspired by super mario. 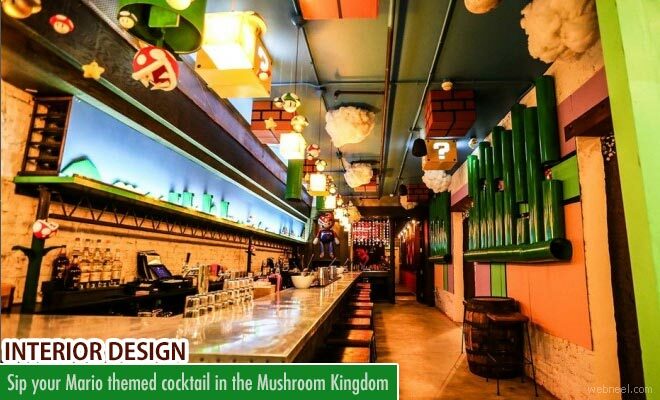 Animatronic piranha plants pop out from green pipes on the ceiling, mystery boxes glow overhead, and a backdrop behind the bar shows the classic 8-bit Super Mario playing field. The cocktails are all about $13 and certainly it suits with the bar's theme. i hope you will like these mario themed interior design photos.